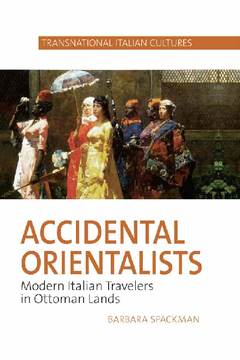 This book identifies a strand of what it calls “Accidental Orientalism” in narratives by Italians who found themselves in Ottoman Egypt and Anatolia in the late nineteenth and early twentieth centuries through historical accident and who wrote about their experiences in Italian, English, and French. Among them are young woman, Amalia Nizzoli, who learned Arabic, conversed the inhabitants of an Ottoman-Egpytian harem, and wrote a memoir in Italian; a young man, Giovanni Finati, who converted to Islam, passed as Albanian in Muhammad Ali’s Egypt, and published his memoir in English; a strongman turned antiquarian, Giovanni Belzoni, whose narrative account in English documents the looting of antiquities by Europeans in Egypt ; a princess and patriot, Cristina Trivulzio di Belgiojoso, who lived in exile in Anatolia and wrote in French condemning the Ottoman harem and proposing social reforms in in the Ottoman empire; and an early twentieth century anarchist and anti-colonialist, Leda Rafanelli, who converted to Islam, wrote prolifically, and posed before the camera in an Orient of her own fashioning. Crossing class, gender, dress, and religious boundaries as they move about the Mediterranean basin, their accounts variously reconfigure, reconsolidate, and often destabilize the imagined East-West divide. Ranging widely on an affective spectrum from Islamophobia to Islamophilia, their narratives are the occasion for the book’s reflection on the practices of cultural cross-dressing, conversion to Islam, and passing and posing as Muslim on the part of Italians who had themselves the object of an Orientalization on the part of Northern Europeans, and whose language had long been the lingua franca of the Mediterranean.